Woodmen of the World Grave 2 | Flickr - Photo Sharing! Westminster, SC. 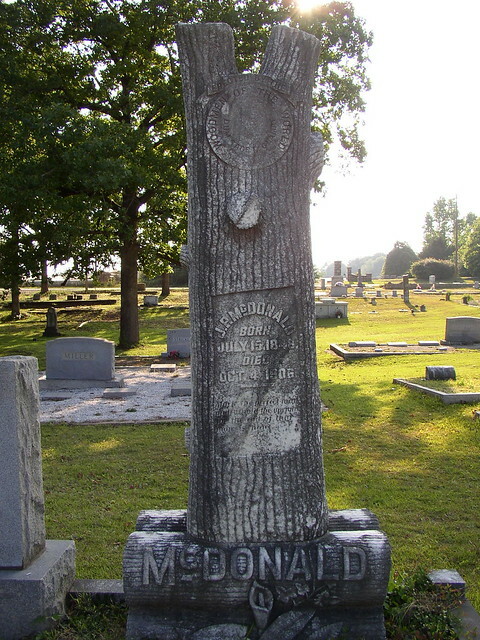 Gravestone donated by Woodmen of the World per seal at top. Do you know who the W.O.W. 's are? They are like the Mason and other secret societies. From the small amount of research I've done it almost seems like the WOW are a fraternal society that somehow evolved into a insurance company. In "About Shmidt" the main character works for WOW. I've been photographing and geotagging WOW monuments for years. A Y-branched top like this is very unusual. I think I've only come across one in person. The seal is huge. But the monument seems to be missing the 3 tools, (the maul, the ax and the wedge) which should be included on all the "standing tree" type WOW monuments. Perhaps they're on the back, but that would be highly unusual. I'd like to see what's on the back of this one.